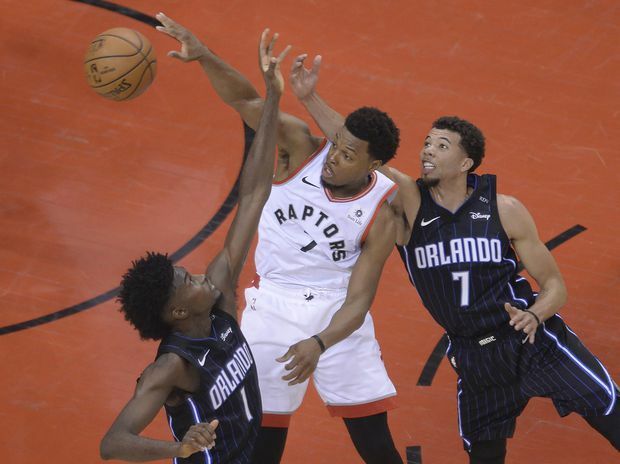 Toronto Raptors guard Kyle Lowry (7) battles Orlando Magic forward Jonathan Isaac (1) and Orlando Magic guard Michael Carter-Williams (7) for the ball during first half NBA basketball playoff action in Toronto, on April 13, 2019. Kyle Lowry shot 0-for-7 in the Toronto Raptors’ Game 1 loss, yet Orlando Magic coach Steve Clifford came away with a glowing impression of the all-star point guard’s performance. It’s safe to say Clifford is not of the same mind as the throngs on social media who are railing on Lowry, saying he’s a regular-season standout who never gets it done in the playoffs. Clifford said Lowry’s fingerprints were all over the game, and he’s not the only one saying it. That plus-minus of 11 was the best of any player in Saturday’s game. Lowry’s stat line also included seven rebounds, two steals and two turnovers. He also stood in to draw a charge – one that ended with the point guard having Terrence Ross’s knee thrust right into his groin. While previous Raptors teams relied more heavily on Lowry for points production, this year’s does far less. The man looking across at Lowry in the backcourt says there’s no way Lowry will be trigger shy in Game 2. In fact, expect Lowry to attack early on in Tuesday’s game as the Raps attempt to break down Clifford’s effective clog-the-paint defence. Lowry was seen back out on the court at Scotiabank Arena shortly after Saturday’s game, working on his shot. But he shrugged off that game on Monday, saying he’s had scoreless games before.